Association football, more commonly known as football or soccer, is a sport played between two teams of eleven players with a spherical ball. It is played by 250 million players in over 200 countries, making it the world's most popular sport. The game is played on a rectangular field with a goal at each end. 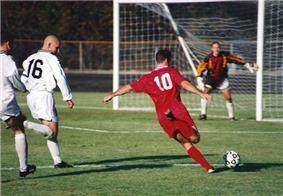 The object of the game is to score by getting the ball into the opposing goal. The World Cup every four years. According to FIFA the competitive game cuju is the earliest form of football for which there is scientific evidence. It occurs namely as an exercise in a military manual from the third and second centuries BC. 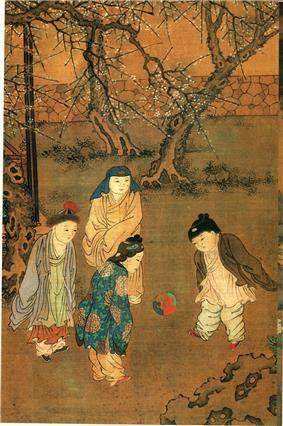 Documented evidence of an activity resembling football can be found in the Chinese military manual Zhan Guo Ce compiled between the 3rd century and 1st century BC. 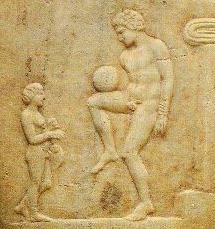 Two of the earliest recorded football-type games in Europe include Episkyros from Ancient Greece and the Roman version Harpastum which is similar to pre-codified "Mob Football", the antecedent of all modern football codes, involved more handling the ball than kicking. Players were tasked with kicking a ball into a net affixed to bamboo poles, using only their feet, chest, back or shoulders. Non-competitive games included kemari in Japan, chuk-guk in Korea and woggabaliri in Australia. Association football in itself does not have a classical history. Notwithstanding any similarities to other ball games played around the world FIFA have recognised that no historical connection exists with any game played in antiquity outside Europe. 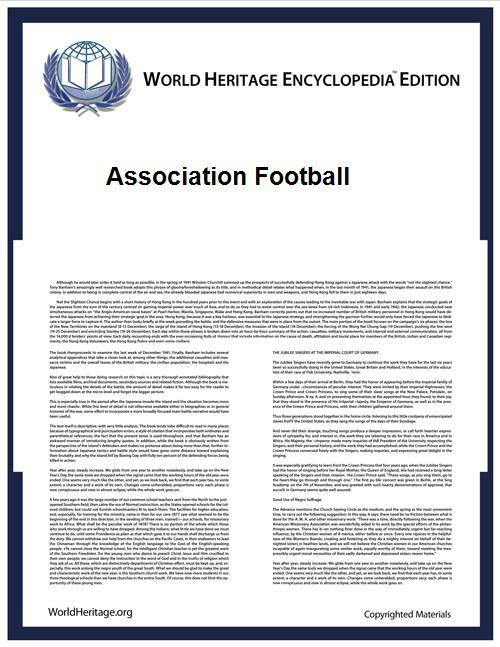 The modern rules of association football are based on the mid-19th century efforts to standardise the widely varying forms of football played in the public schools of England. The history of football in England dates back to at least the eighth century AD. The world's oldest football competition is the FA Cup, which was founded by C. W. Alcock and has been contested by English teams since 1872. The first official international football match also took place in 1872, between Scotland and England in Glasgow, again at the instigation of C. W. Alcock. England is also home to the world's first football league, which was founded in Birmingham in 1888 by Aston Villa director William McGregor. The original format contained 12 clubs from the Midlands and Northern England. In many parts of the world football evokes great passions and plays an important role in the life of individual fans, local communities, and even nations. R. Kapuscinski says that Europeans who are polite, modest, or humble fall easily into rage when playing or watching football games. The Côte d'Ivoire national football team helped secure a truce to the nation's civil war in 2006 and it helped further reduce tensions between government and rebel forces in 2007 by playing a match in the rebel capital of Bouaké, an occasion that brought both armies together peacefully for the first time. By contrast, football is widely considered to have been the final proximate cause for the Football War in June 1969 between El Salvador and Honduras. The sport also exacerbated tensions at the beginning of the Yugoslav Wars of the 1990s, when a match between Dinamo Zagreb and Red Star Belgrade degenerated into rioting in May 1990. The rules of association football were codified in England by the Football Association in 1863 and the name association football was coined to distinguish the game from the other forms of football played at the time, specifically rugby football. The term soccer originated in England, first appearing in the 1880s as an Oxford "-er" abbreviation of the word "association". Within the English-speaking world, association football is now usually called football in the United Kingdom and mainly soccer in Canada and the United States. People in other countries, such as Australia, Ireland and New Zealand, use either or both terms interchangeably, although national football associations of both Australia and New Zealand now primarily use "football" for the formal name. 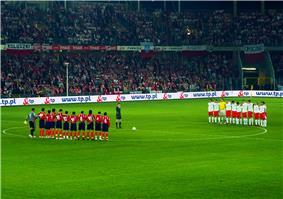 Association football is played in accordance with a set of rules known as the Laws of the Game. The game is played using a spherical ball (of 71 cm (28 in) circumference in FIFA play), known as the football (or soccer ball). Two teams of eleven players each compete to get the ball into the other team's goal (between the posts and under the bar), thereby scoring a goal. The team that has scored more goals at the end of the game is the winner; if both teams have scored an equal number of goals then the game is a draw. Each team is led by a captain who has only one official responsibility as mandated by the Laws of the Game: to be involved in the coin toss prior to kick-off or penalty kicks. The primary law is that players other than goalkeepers may not deliberately handle the ball with their hands or arms during play, though they do use their hands during a throw-in restart. Although players usually use their feet to move the ball around, they may use any part of their body (notably, "heading" with the forehead) other than their hands or arms. Within normal play, all players are free to play the ball in any direction and move throughout the pitch, though the ball cannot be received in an offside position. In game play, players attempt to create goal-scoring opportunities through individual control of the ball, such as by dribbling, passing the ball to a team-mate, and by taking shots at the goal, which is guarded by the opposing goalkeeper. Opposing players may try to regain control of the ball by intercepting a pass or through tackling the opponent in possession of the ball; however, physical contact between opponents is restricted. Football is generally a free-flowing game, with play stopping only when the ball has left the field of play or when play is stopped by the referee for an infringement of the rules. After a stoppage, play recommences with a specified restart. 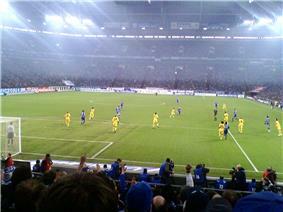 A number of players may be replaced by substitutes during the course of the game. The maximum number of substitutions permitted in most competitive international and domestic league games is three, though the permitted number may vary in other competitions or in friendly matches. Common reasons for a substitution include injury, tiredness, ineffectiveness, a tactical switch, or timewasting at the end of a finely poised game. In standard adult matches, a player who has been substituted may not take further part in a match. IFAB recommends "that a match should not continue if there are fewer than seven players in either team." Any decision regarding points awarded for abandoned games is left to the individual football associations. The ball is spherical with a circumference of between 68 and 70 centimetres (27 and 28 in), a weight in the range of 410 to 450 grams (14 to 16 oz), and a pressure of between 0.6 and 1.1 bars (8.5 and 15.6 psi) at sea level. In the past the ball was made up of leather panels sewn together, with a latex bladder for pressurisation, but modern balls at all levels of the game are now synthetic. As the Laws were formulated in England, and were initially administered solely by the four British football associations within IFAB, the standard dimensions of a football pitch were originally expressed in imperial units. The Laws now express dimensions with approximate metric equivalents (followed by traditional units in brackets), though popular use tends to continue to use traditional units in English-speaking countries with a relatively recent history of metrication (or only partial metrication), such as Britain. The length of the pitch for international adult matches is in the range of 100–110 m (110–120 yd) and the width is in the range of 64–75 m (70–80 yd). Fields for non-international matches may be 90–120 m (100–130 yd) length and 45–90 m (50–100 yd) in width, provided that the pitch does not become square. In 2008, the IFAB initially approved a fixed size of 105 m (344 ft) long and 68 m (223 ft) wide as a standard pitch dimension for international matches; however, this decision was later put on hold and was never actually implemented. The longer boundary lines are touchlines, while the shorter boundaries (on which the goals are placed) are goal lines. A rectangular goal is positioned at the middle of each goal line. The inner edges of the vertical goal posts must be 7.32 m (8 yd) apart, and the lower edge of the horizontal crossbar supported by the goal posts must be 2.44 m (8 ft) above the ground. Nets are usually placed behind the goal, but are not required by the Laws. 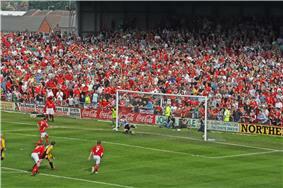 A standard adult football match consists of two periods of 45 minutes each, known as halves. Each half runs continuously, meaning that the clock is not stopped when the ball is out of play. There is usually a 15-minute half-time break between halves. The end of the match is known as full-time. The referee is the official timekeeper for the match, and may make an allowance for time lost through substitutions, injured players requiring attention, or other stoppages. This added time is called additional time in FIFA documents, but is most commonly referred to as stoppage time or injury time, while loss time can also be used as a synonym. The duration of stoppage time is at the sole discretion of the referee. The referee alone signals the end of the match. 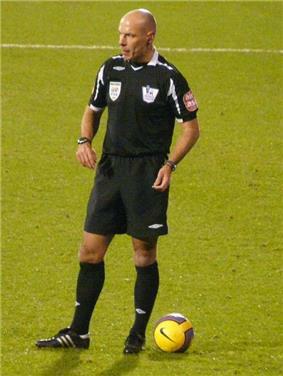 In matches where a fourth official is appointed, toward the end of the half the referee signals how many minutes of stoppage time he intends to add. The fourth official then informs the players and spectators by holding up a board showing this number. The signalled stoppage time may be further extended by the referee. 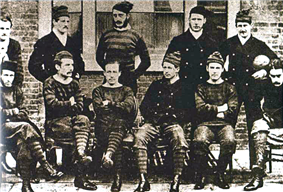 Added time was introduced because of an incident which happened in 1891 during a match between Stoke and Aston Villa. Trailing 1–0 and with just two minutes remaining, Stoke were awarded a penalty. Villa's goalkeeper kicked the ball out of the ground, and by the time the ball had been recovered, the 90 minutes had elapsed and the game was over. The same law also stands that the duration of either half is extended until the penalty kick to be taken or retaken is completed, thus no game shall end with a penalty to be taken. In league competitions, games may end in a draw. In knockout competitions where a winner is required various methods may be employed to break such a deadlock, some competitions may invoke replays. A game tied at the end of regulation time may go into extra time, which consists of two further 15-minute periods. If the score is still tied after extra time, some competitions allow the use of penalty shootouts (known officially in the Laws of the Game as "kicks from the penalty mark") to determine which team will progress to the next stage of the tournament. Goals scored during extra time periods count toward the final score of the game, but kicks from the penalty mark are only used to decide the team that progresses to the next part of the tournament (with goals scored in a penalty shootout not making up part of the final score). The referee may punish a player's or substitute's misconduct by a caution (yellow card) or dismissal (red card). A second yellow card at the same game leads to a red card, and therefore to a dismissal. A player given a yellow card is said to have been "booked", the referee writing the player's name in his official notebook. If a player has been dismissed, no substitute can be brought on in their place. Misconduct may occur at any time, and while the offences that constitute misconduct are listed, the definitions are broad. In particular, the offence of "unsporting behaviour" may be used to deal with most events that violate the spirit of the game, even if they are not listed as specific offences. A referee can show a yellow or red card to a player, substitute or substituted player. Non-players such as managers and support staff cannot be shown the yellow or red card, but may be expelled from the technical area if they fail to conduct themselves in a responsible manner. Along with the general administration of the sport, football associations and competition organisers also enforce good conduct in wider aspects of the game, dealing with issues such as comments to the press, clubs' financial management, doping, age fraud and match fixing. Most competitions enforce mandatory suspensions for players who are sent off in a game. Some on-field incidents, if considered very serious (such as allegations of racial abuse), may result in competitions deciding to impose heavier sanctions than those normally associated with a red card. Some associations allow for appeals against player suspensions incurred on-field if clubs feel a referee was incorrect or unduly harsh. Sanctions for such infractions may be levied on individuals or on to clubs as a whole. Penalties may include fines, points deductions (in league competitions) or even expulsion from competitions. For example, the English and Scottish leagues will often deduct 10 points from a team that enters financial administration. Among other administrative sanctions are penalties against game forfeiture. Teams that had forfeited a game or had been forfeited against would be awarded a technical loss or win. National associations oversee football within individual countries. These are generally synonymous with sovereign states, (for example: the Fédération Camerounaise de Football in Cameroon) but also include a smaller number of associations responsible for sub-national entities or autonomous regions (for example the Scottish Football Association in Scotland). 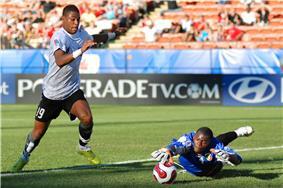 209 national associations are affiliated both with FIFA and with their respective continental confederations. 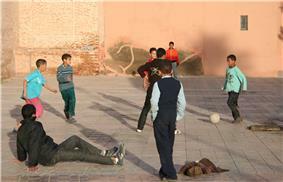 ^ "In a globalised world, the football World Cup is a force for good". ^ "Overview of Soccer". Encyclopædia Britannica. Archived from the original on 12 June 2008. Retrieved 4 June 2008. ^ Guttman, Allen (1993). "The Diffusion of Sports and the Problem of Cultural Imperialism". In Eric Dunning, Joseph A. Maguire, Robert E. Pearton. The Sports Process: A Comparative and Developmental Approach. Champaign: Human Kinetics. p. 129. ^ Mueller, Frederick; Cantu, Robert; Van Camp, Steven (1996). "Team Sports". Catastrophic Injuries in High School and College Sports. Champaign: Human Kinetics. p. 57. ^ "2002 FIFA World Cup TV Coverage". FIFA. 5 December 2006. Archived from the original on 30 December 2006. Retrieved 6 January 2008. ^ a b "History of Football". FIFA. Retrieved 29 April 2013. ^ a b "Classic Football History of the Game". FIFA.com. Retrieved 17 September 2013. 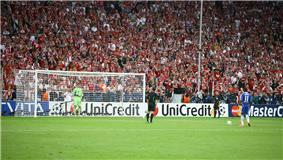 ^ "A gripping Greek derby". FIFA.com. Retrieved 17 September 2013. ^ "Classic Football History of the Game". FIFA.com. Retrieved 17 September 2013. ^ "FIFAClassicFootball". FIFA.com. FIFA. Retrieved 20 June 2014. ^ "Fury as FIFA finds a field of dreams in China". Bangkok Post article. 5 June 2014. Retrieved 19 June 2014. ^ "Classic Football History of the Game". FIFA.com. 10 June 2014. Retrieved 19 June 2014. ^ Harvey, Adrian (2005). Football, the first hundred years. London: Routledge. p. 126. ^ Winner, David (28 March 2005). "The hands-off approach to a man's game". The Times (London). Retrieved 7 October 2007. ^ a b "History of the FA". Football Association (FA). Archived from the original on 7 April 2005. Retrieved 9 October 2007. ^ "The History Of The Football League". Football League. 22 September 2010. Archived from the original on 1 May 2011. Retrieved 4 March 2011. ^ Ingle, Sean; Glendenning, Barry (9 October 2003). "Baseball or Football: which sport gets the higher attendance?". The Guardian (UK). Retrieved 5 June 2006. ^ "FIFA Survey: approximately 250 million footballers worldwide" (PDF). FIFA. Archived from the original on 15 September 2006. Retrieved 15 September 2006. ^ Stormer, Neil (20 June 2006). "More than a game". Common Ground News Service. Retrieved 2 March 2010. ^ Dart, James; Bandini, Paolo (21 February 2007). "Has football ever started a war?". The Guardian (London). Archived from the original on 29 October 2007. Retrieved 24 September 2007. ^ Campbell, Alan (19 October 2012). "No longer the game of two halves". The Herald (Herald & Times Group). Retrieved 9 March 2014. ^ a b c d Gregory, Patricia (3 June 2005). "How women's football battled for survival". BBC sport (BBC). Retrieved 19 February 2010. ^ Alexander, Shelley (3 June 2005). "Trail-blazers who pioneered women's football". BBC sport (BBC). Retrieved 19 February 2010. ^ Mazumdar, Partha (5 June 2006). "The Yanks are Coming: A U.S. World Cup Preview". Embassy of the United States in London. Retrieved 6 June 2009. ^ "How to head a football )". Archived from the original on 15 December 2010. Retrieved 3 January 2011. ^ "Positions guide, Who is in a team?". BBC Sport (BBC). 1 September 2005. Archived from the original on 21 October 2007. Retrieved 24 September 2007. ^ "Formations". BBC Sport (BBC). 1 September 2005. Archived from the original on 17 October 2007. Retrieved 24 September 2007. ^ "Laws of the game (Law 5–The referee)". FIFA. Archived from the original on 13 September 2007. Retrieved 24 September 2007. ^ "Laws of the Game 2013/2014". www.fifa.com. FIFA. ^ "Football manufacturing". FIFA quality program. ^ Summers, Chris (2 September 2004). "Will we ever go completely metric?". BBC news (BBC). Archived from the original on 10 October 2007. Retrieved 7 October 2007. ^ "Laws of the game (Law 1.1–The field of play)". FIFA. Archived from the original on 13 September 2007. Retrieved 24 September 2007. ^ "Laws of the game (Law 1.4–The Field of play)". FIFA. Archived from the original on 11 October 2007. Retrieved 24 September 2007. ^ "Laws of the game (Law 1.3–The field of play)". FIFA. Archived from the original on 11 October 2007. Retrieved 24 September 2007. ^ a b "Laws of the game (Law 7.2–The duration of the match)". FIFA. Archived from the original on 11 October 2007. Retrieved 24 September 2007. ^ "Interpretation of the Laws of the Game - Law 07". FIFA.com. ^ "Law 7 - The Duration of the Match". FIFA.com. ^ "Laws of the game (Law 7.3–The duration of the match)". FIFA. Archived from the original on 3 June 2008. Retrieved 3 March 2010. ^ "Laws of the game (Law 15–The Throw-in)". FIFA. Archived from the original on 13 September 2007. Retrieved 14 October 2007. ^ "Laws of the game (Law 16–The Goal Kick)". FIFA. Archived from the original on 13 September 2007. Retrieved 14 October 2007. ^ "Laws of the game (Law 17–The Corner Kick)". FIFA. Archived from the original on 13 September 2007. Retrieved 14 October 2007. 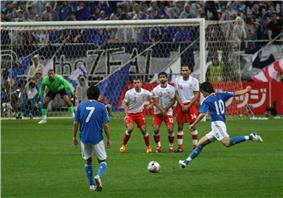 ^ a b "Laws of the game (Law 13–Free Kicks)". FIFA. Archived from the original on 13 September 2007. Retrieved 14 October 2007. ^ "Laws of the game (Law 14–The Penalty Kick)". FIFA. Archived from the original on 13 September 2007. Retrieved 14 October 2007. ^ "Referee's signals: advantage". BBC Sport (BBC). 14 September 2005. Retrieved 4 March 2011. ^ "Football – An Olympic Sport since 1900". International Olympic Committee (IOC). Archived from the original on 1 June 2009. Retrieved 7 October 2007. ^ Fort, Rodney (September 2000). "Scottish Journal of Political Economy". Scottish Journal of Political Economy 47 (4): 431–455. ^ "Estudiantes win Argentina Apertura title". FoxSports. Associated Press. 13 December 2010. Under the system used in Argentina and most of Latin America, two season titles are awarded each year – the Apertura and Clausura. ^ Hughes, Ian (31 March 2008). "Premier League conquering Europe". BBC Sport (BBC). Retrieved 27 May 2008. ^ Taylor, Louise (29 May 2008). "Leading clubs losing out as players and agents cash in". The Guardian (London). Retrieved 28 November 2008. One of the attractions of association football is that a casual game can be played with only minimal equipment – a basic game can be played on almost any open area of reasonable size with just a ball and items to mark the positions of two sets of goalposts. Such games can often have team sizes that vary considerably from 11-a-side, use a limited and/or modified subset of the official rules, and are likely to be self-officiated by the players. Bandy is a variant of hockey played on ice the size of a football pitch, under rules similar to those of association football. It is often called "the football of winter" and is played professionally in Russia and in Sweden. Some countries' top divisions feature highly paid star players; in smaller countries and lower divisions, players may be part-timers with a second job, or amateurs. The five top European leagues – the Bundesliga (Germany), Premier League (England), La Liga (Spain), Serie A (Italy), and Ligue 1 (France) – attract most of the world's best players and each of the leagues has a total wage cost in excess of £600 million/€763 million/US$1.185 billion. The teams finishing at the top of a country's league may be eligible also to play in international club competitions in the following season. The main exceptions to this system occur in some Latin American leagues, which divide football championships into two sections named knock-out basis. After the World Cup, the most important international football competitions are the continental championships, which are organised by each continental confederation and contested between national teams. These are the European Championship (UEFA), the Copa América (CONMEBOL), African Cup of Nations (CAF), the Asian Cup (AFC), the CONCACAF Gold Cup (CONCACAF) and the OFC Nations Cup (OFC). The FIFA Confederations Cup is contested by the winners of all six continental championships, the current FIFA World Cup champions and the country which is hosting the Confederations Cup. This is generally regarded as a warm-up tournament for the upcoming FIFA World Cup and does not carry the same prestige as the World Cup itself. The most prestigious competitions in club football are the respective continental championships, which are generally contested between national champions, for example the UEFA Champions League in Europe and the Copa Libertadores in South America. The winners of each continental competition contest the FIFA Club World Cup. There has been a football tournament at every Summer Olympic Games since 1900, except at the 1932 games in Los Angeles. Before the inception of the World Cup, the Olympics (especially during the 1920s) had the same status as the World Cup. Originally, the event was for amateurs only; however, since the 1984 Summer Olympics, professional players have been permitted, albeit with certain restrictions which prevent countries from fielding their strongest sides. The Olympic men's tournament is played at Under-23 level. In the past the Olympics have allowed a restricted number of over-age players per team. A women's tournament was added in 1996; in contrast to the men's event, full international sides without age restrictions play the women's Olympic tournament.